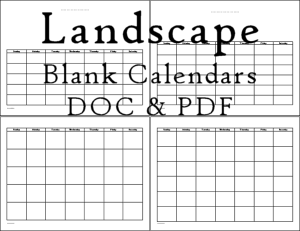 This page features three styles of printable blank calendars with a layout of one month per page in landscape. Read more about the styles at each group of files. Most of the months will require a layout with 5 rows and just two or more months will need a 6-row layout. Each set includes calendars with both 5-row and 6-row layouts and to help you know how many 6-row layouts to print, see the paragraph below. 2019: 2 months ( March, June ) require a 6th row. 2020: 2 months ( May, August ) require a 6th row. 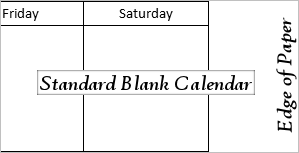 If you need to know which day of the week starts each month and the holiday dates go to this page, Data for Blank Calendars. This set of blank calendars includes both PDF and DOC files. 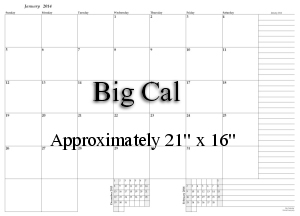 All of the calendars in this set print in landscape orientation. There is only one PDF file and one doc file. Each file contains all four choices. In each of the two types, one has 5 rows and the other has 6 rows. 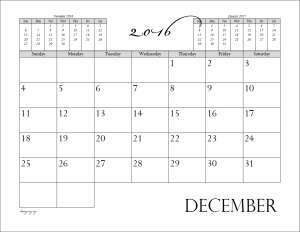 Most of the months in a year will use the calendar with 5 rows. Weekends are minimized in this layout with open side margins. Cells for Monday through Friday are wider than normal because the cells for the weekends are cut in half. 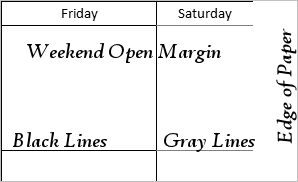 The open margins allow overflow for the smaller weekend cells. So, if you normally need more space for Monday through Friday, use this style. The files are available in PDF and, for YoungMinds subscribers, DOCX. I used fine lines in the files and your monitor will very likely not display all of the cell borders, but the calendar should print well. However, if the calendar prints with missing lines download the file to your computer and print it from adobe reader. Normal indicates that the row height is the same as the 6-row calendar. Stretch indicates that I increased the row height to better fit the space. 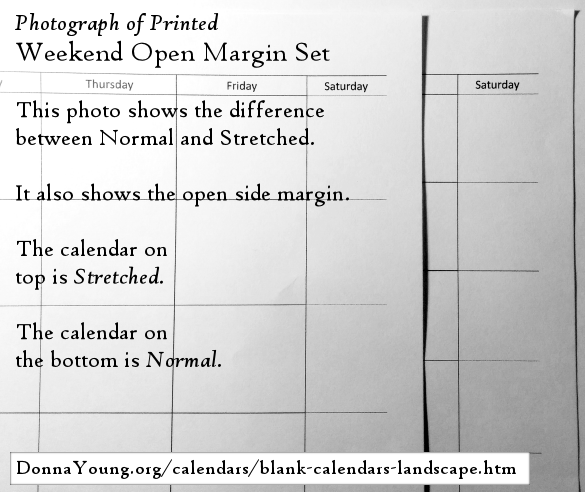 Click on this link to see a cropped photograph of two printed Open Margin calendars that show the difference between Normal and Stretch. 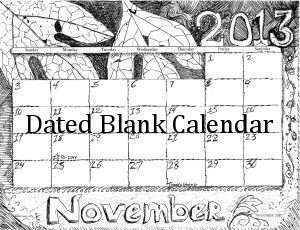 The Standard Blank Calendar is about as ordinary as a blank calendar can be. The date cells are the same size and outlined in thin black lines. The margins are wider than I normally allow in this type of printable file. If you need margin space more than you need date cell space, then use this style. Because I used fine lines in the files, they will not look good on your monitor, but they should print well. If the calendar prints with missing lines, then download the file to your computer and print it from adobe reader. The files are available in PDF and, for YoungMinds subscribers, DOCX.